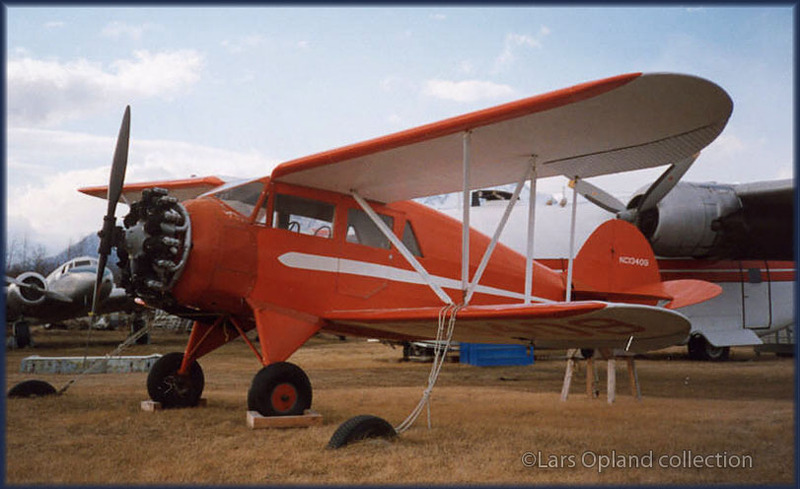 Lars Opland lives in Wasilla,Alaska and we started exchanging emails when I asked around on the internet for info Mirow Air Services and the Stinson; soon Lars started to send interesting images, some of them I would like to share here. 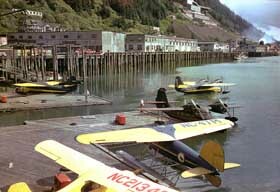 Lars noticed my photos from the Hangar in Juneau and sent me this historic scene. 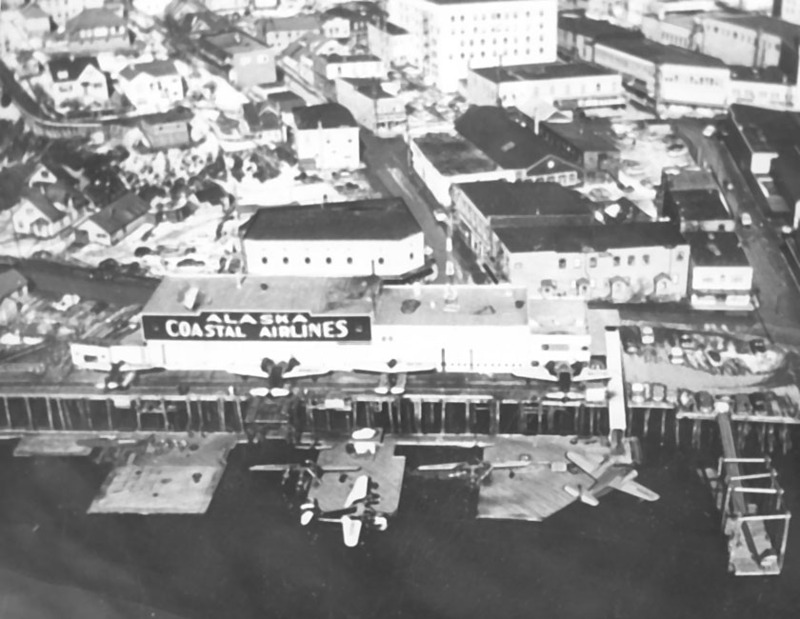 This aerial view of the Juneau waterfront, circa late 1940's, is from the archives of the Museum of Alaska Transportation & Industry; just something Lars discovered while rummaging through their file cabinets. He wrote: "The transportation museum is just less than 2 miles from my place and I kept my membership current until they started closing all winter. I did all my research there during winter weekend hours and I discovered many treasures in their file cabinets. 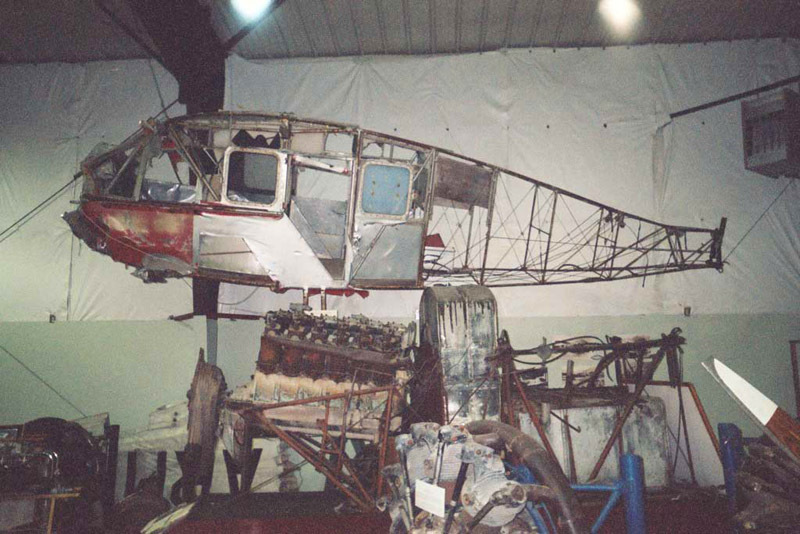 Bob Reeve's last Fairchild 71 languishes unrestored here, it is in pieces in a locked storage building. Some of the best photos here have never yet been displayed. There is no online archive that I am aware of." Lars wrote here: "Another view of the Juneau waterfront; this one will be familiar to you if you have been thorough in your shopping trip to Title Wave in Anchorage, as it is the cover photo from "Alaskan Wings" by Jim Ruotsala! Jim, by-the-way, is an old friend, though I have this scan through another mutual friend, Ted Spencer." Another fine shot from the Juneau waterfront. "Here's "Nugget" from another angle while we're at it; another scan from Ted Spencer. 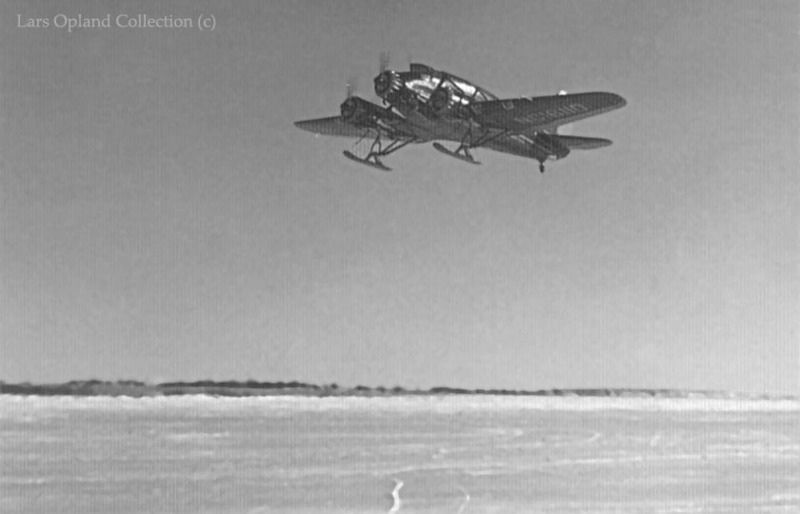 NC47M was not a "typical" Vega floatplane at this point, fitted with non-standard engine, cowling & floats". 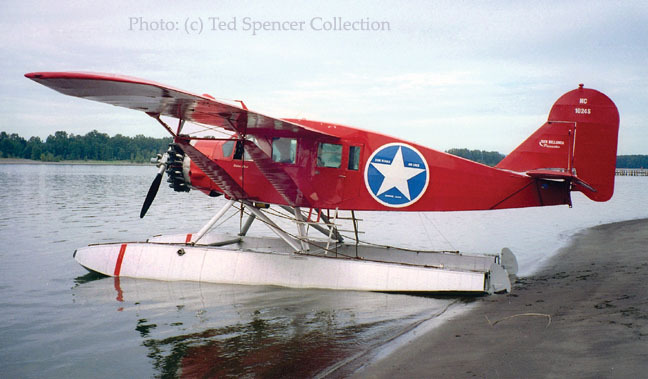 "Ted Spencer uses the name, Alaskan Historical Aircraft Society, though he now lives in California. 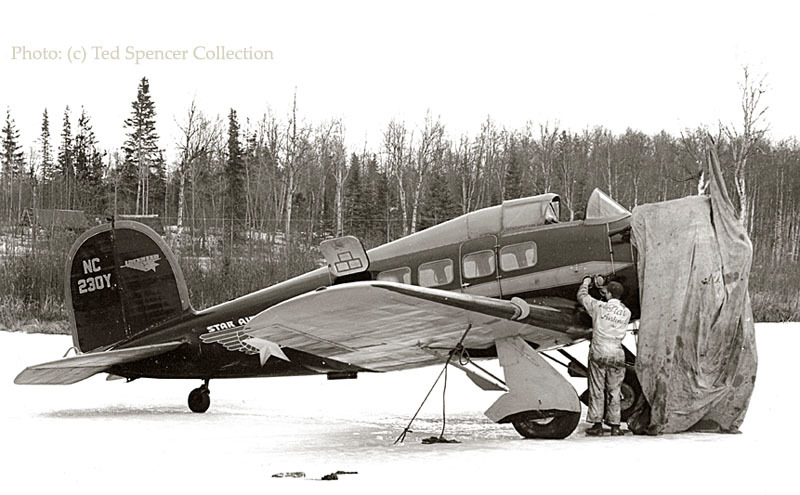 I am sure he won't mind us using the photos he has provided as long as he gets proper credit: "Photo courtesy of Ted Spencer, Alaska Historical Aircraft Society". 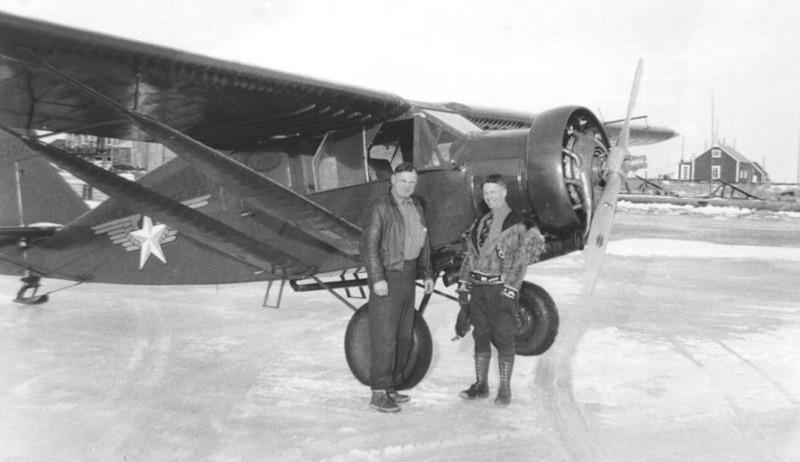 He used to be Director at the Alaska Aviation Heritage Museum at Lake Hood. he and jim Ruotsala shared a lot of research." Dave Moody volunteered following information: "I didn't think it was Hans Mirow in the picture either. I got this same picture from Lars and questioned it. And when walking through the Anchorage airport, I looked at their historical collection, they have several pictures of old aviators. So I came to the conclusion his name is Ed Young. I'm sure of it!" (See also Sharon Penprase' reaction further below). Also the following reaction confirms the person to be Jack Jefford: "I agree with Hans Mirow's granddaughter. That is Jack Jefford in a rare photo of him without his mustache. He was my uncle! I am from Nome, where my mother (his sister) and grandmother (Jack's mother) raised me. I'll look back through some of the old family photos and see if I can find another without his moustache. Haven't seen this one before." "Alaskan aviation matured quickly in 1929. 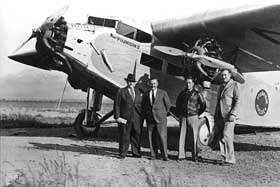 The early barnstormers had had incredible luck walking away from crash after crash, but in 1929, all that changed. 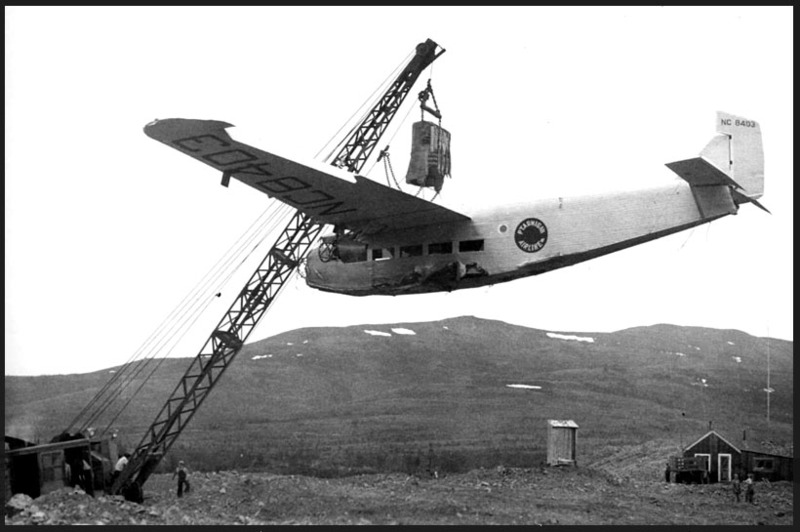 In September of 1929, Russell Merrill departed on a flight from Anchorage to the Nyac mine near Bethel. He was never seen again. 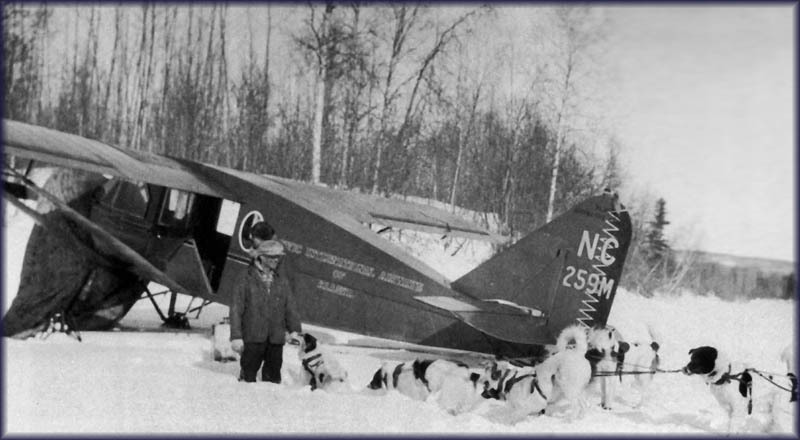 On November 9,1929 Ben Eielson was lost while enroute to Siberia. 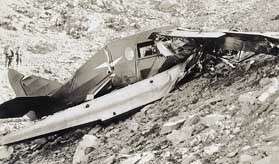 Ed Young was killed when his Fairchild 71 crashed at Livengood. The last to find his fate was Ralph Wien. 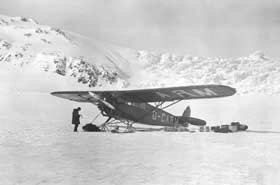 On October 12, 1930, Wien crashed at Kotzebue killing him and two priests." "Hello, my great uncle was George Edward 'Ed' Young. 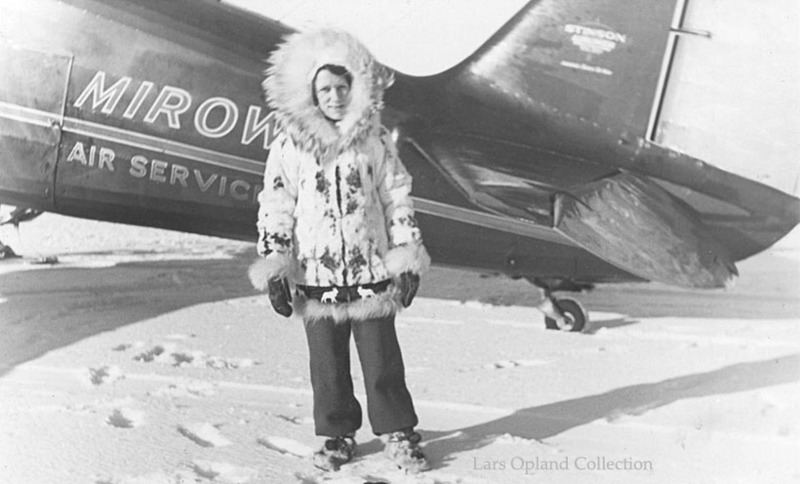 He was a bush pilot in Alaska and is one of the pilots featured in Sourdough Skies. 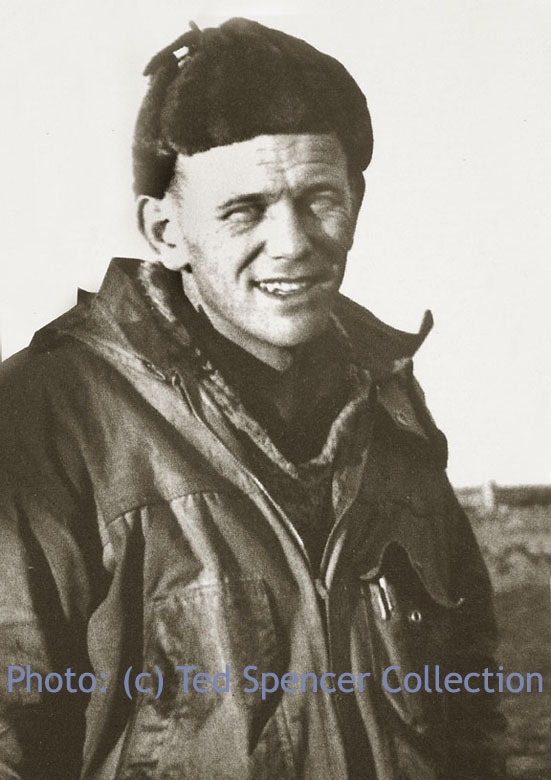 The picture you have of the 'unknown' pilot might be my great uncle (although I usually saw him [in pictures] more bundled up)..."
I am George 'Ed' Young’s granddaughter and looked at the picture of the 'unknown pilot'. That is definitely my grandfather! "There's a big problem with identifying the guy with the pipe as Ed Young. He is supposed to have died in the early 1930's. 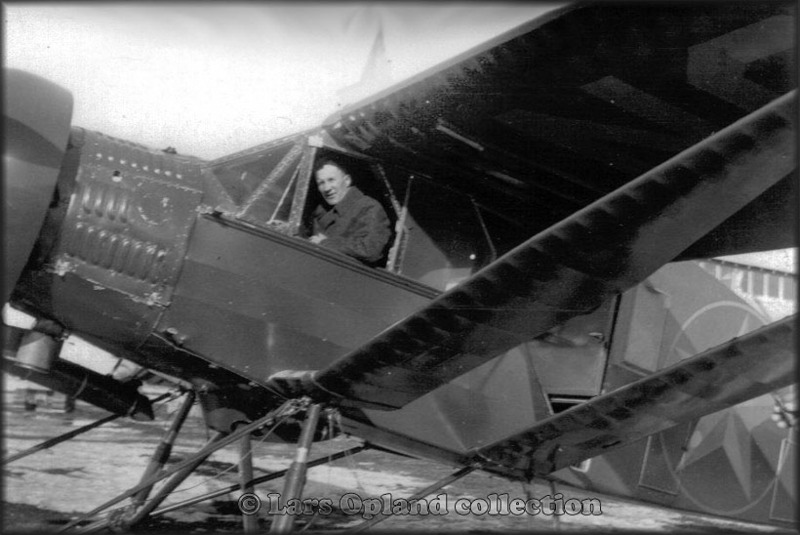 Our pipe smoker is standing in front of a Stinson A trimotor. 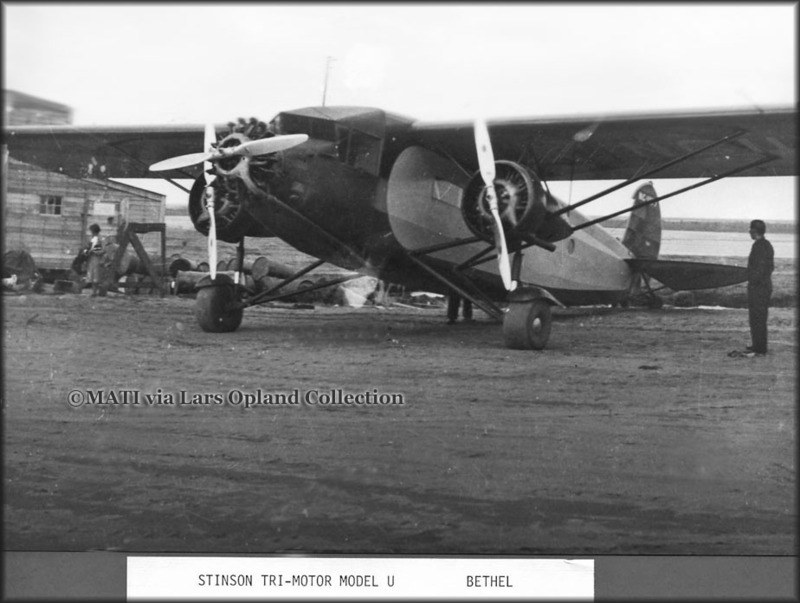 The first Stinson A was rolled out in 1934 and these were only starting to be delivered to their primary owners (American Airlines, Delta, etc.) in the winter of 1934-35. 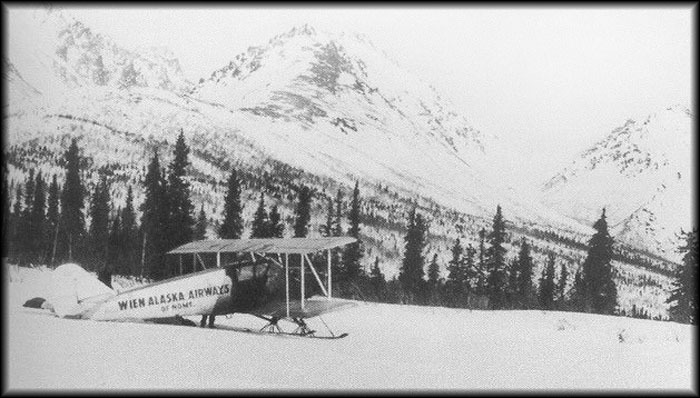 Some were sold as used by 1936 but none reached Alaska until the late 30's. There's a similarity but I highly doubt this is Ed Young..."
"The picture you added of my great-uncle Ed Young (below), which is one our family has, is fantastic. Seeing the unidentified person’s and my great-uncle’s pictures closer together, I’d have to agree that the unidentified person is likely not George Young. I imagine my cousin Elaine has more pictures of him. I just find this all so interesting. Thank you for all your hard work on this." MIROW, HANS. "Flew for National Air Transport in 1933. 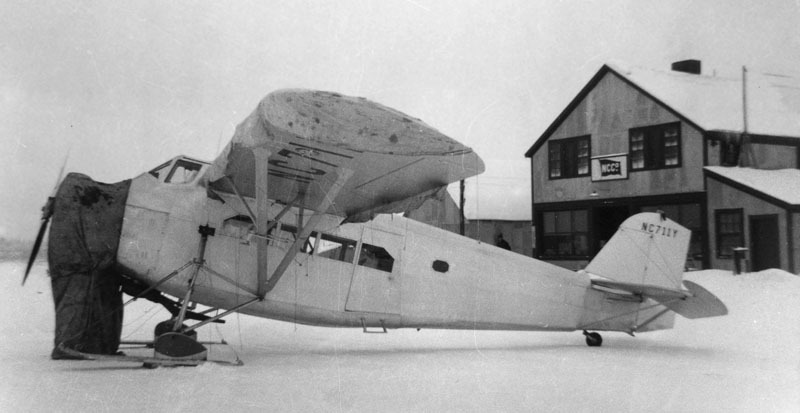 Formed Mirow Flying Service in 1935 based at Nome. Died in plane crash while on a search for one of his planes." 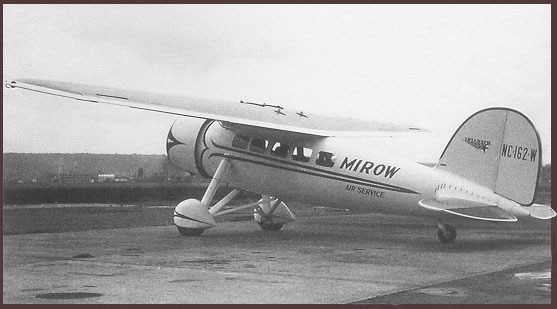 Mirow Air Service was one of three airlines merged in 1944 to form Alaska Airlines. 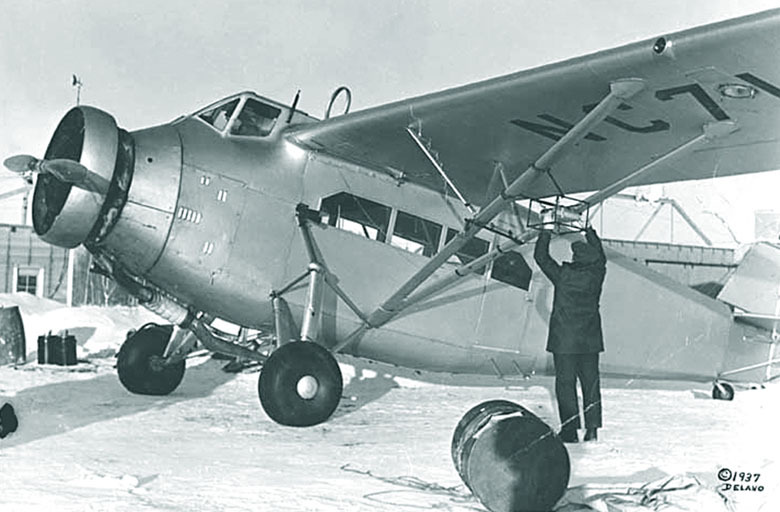 Some mention of Hans Mirow is made on the page concerning Lockheed Vega 5B NC162W: "...sold it on September 19, 1935 to Hans Mirow of Nome, AK to be flown on skis for charter work in Alaska. 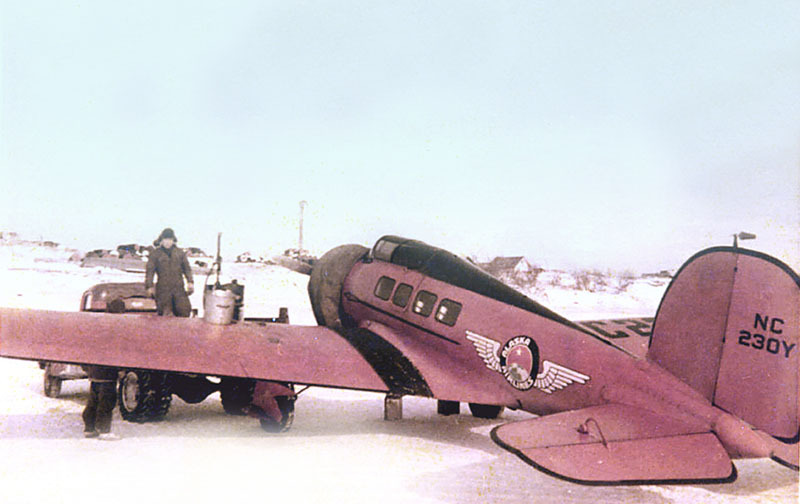 It suffered its second accident at Nome on April 28, 1936. It was completely rebuilt by Northwest Air Service in Seattle, WA as of August 1936. "Here is a photo from my Grandpa's album, this is my grandmother: Martha Opland." "Stinson Tri-Motor NC16110 on a nice fly by; also from my Grandpa's collection. " Chartered by Reindeer Acquisition Unit for 3 months, Mirow Air Service, Nome, Alaska"
Stinson Tri-Motor of Alaska Star Airlines. Stinson Tri-Motor NC15109 (c/n 9109) of Alaska Airlines. Photo: Museum of Alaska Transportation & Industry archives. "One of Alaska Star Airlines' aircraft (ca. 1944?) either just before, or just after Alaska Star changed its corporate name to Alaska Airlines, Inc.
NC15109 was an ex-American Airlines Stinson A"
"These were taken about 1944, as Alaska Star Airlines was changing it's identity and had begun painting over the word "Star" from the logos among its fleet, as on this TravelAir (NC615K? NC515K? NC516K?). 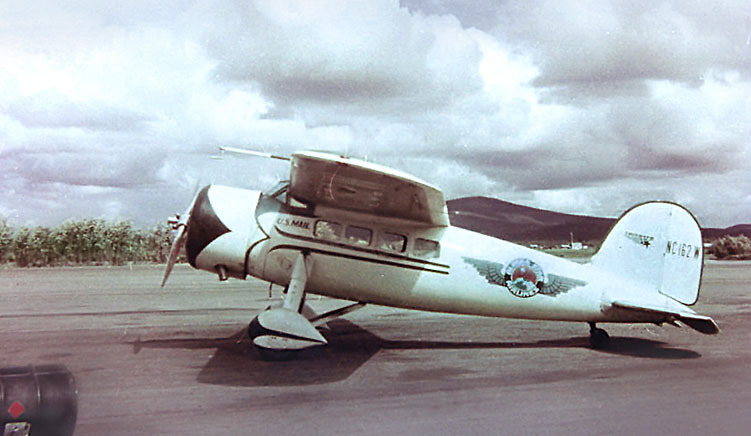 You can see here that Vega NC162W had wing & stabilizer panels painted gold, to match the wings on it's logos." "NC162W appears in the MATI archives first among the many beautiful photos of the William Fike Collection. 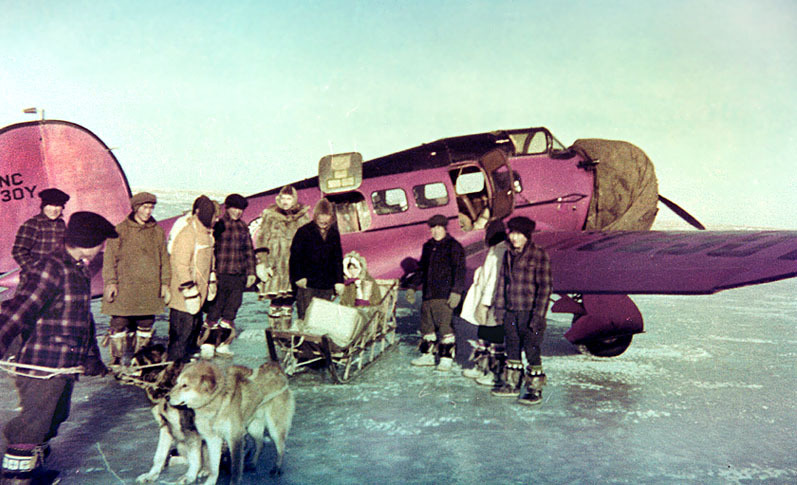 Mr. Fike was an Alaska Star Airlines pilot through the early 1940's and he took many B&W and color photos of the aircraft in use at the time. Star's only Vega appears often among these." 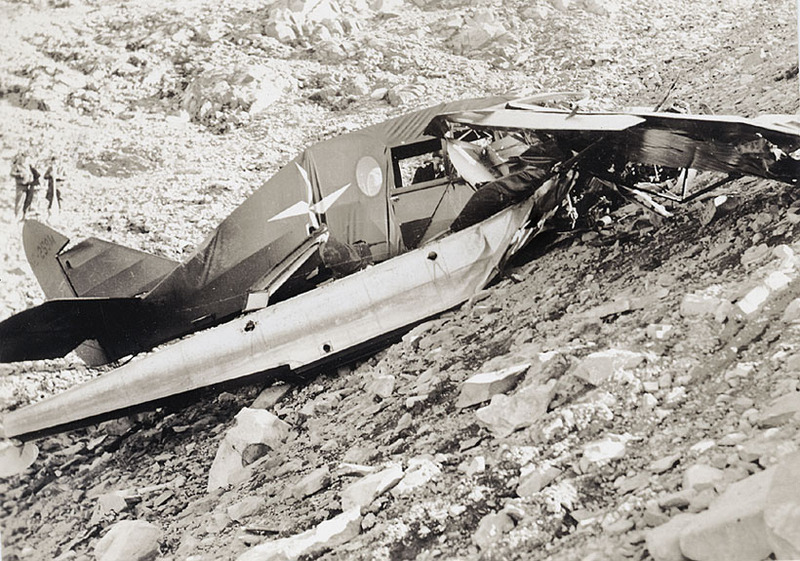 Lockheed Vega 5B NC162W (c/n 128) was involved in an accident, without fatalities, on 08Feb44, no details. NC162 while in service with Mirow Air Service. "This one I found in the William Fike Collection. Not sure if this is colorized, but a fine portrait. " Photo: courtesy Ted Spencer collection. Lars Opland sent me this photo, seeing the remains on my page dedicated to my 2003 visit to the Alaska Air Museum at Lake Hood. 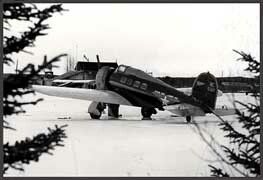 This Ford Trimotor NC8403 was groundlooped at Flat, Alaska if I remember correctly; it was written off and further damaged in moving it off the runway. It's engines were salvaged and it sat for some time until the remains were recovered and stored at the Alaska Aviation Heritage Museum in Anchorage. Most recently, I understand that it has been bought by a stateside collector who plans a total rebuild, which will be a very ambitious undertaking judging by what I last saw of it. Lockheed Orion NC230Y; phantastic photo! "This livery looks like about 1940"
NC230Y at Crooked Creek, circa 1944. 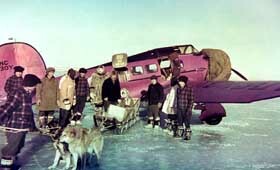 Boarding/disembarking passengers Alaska-style: on the ice! 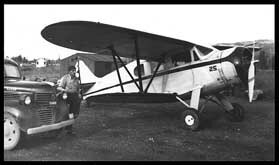 Star Air had 2 Waco "Custom Cabin" biplanes in the early '40's; Bill Fike took the pictures. Star Air Service had several Bellancas through the 1930's & early 1940's, including 2 CH-400 Skyrockets & at least 3 CH-300 Pacemakers. Of the Pacemakers, the one I have the most photos of is NC259M "Aquila". 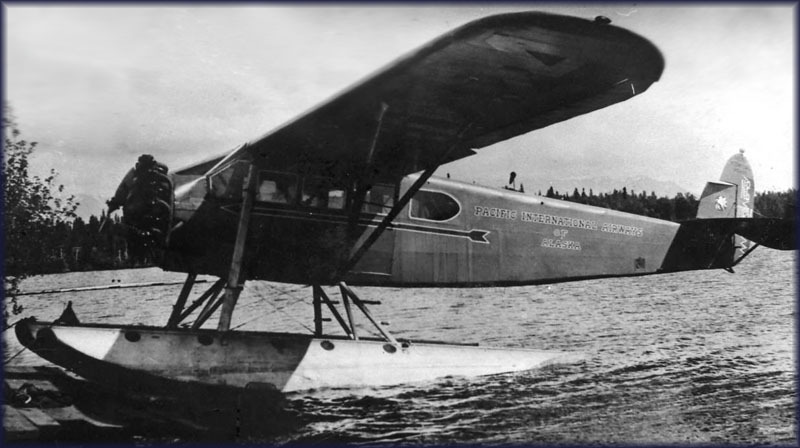 This one was brought to Alaska in the winter of 1929-30 to fly for Pacific International Airways; it was new or nearly new at the time. PIA fleet photo courtesy of Ted Spencer. PIA went through 3 different liveries during it's short history and NC259M wore 2 of them; this is the second. Another one below, with the dogs. Sold to Star Air Service in 1933, NC259M was repainted in, what is described in "Sourdough Sky" by Mills & Phillips as red & yellow. it was named "Aquila". 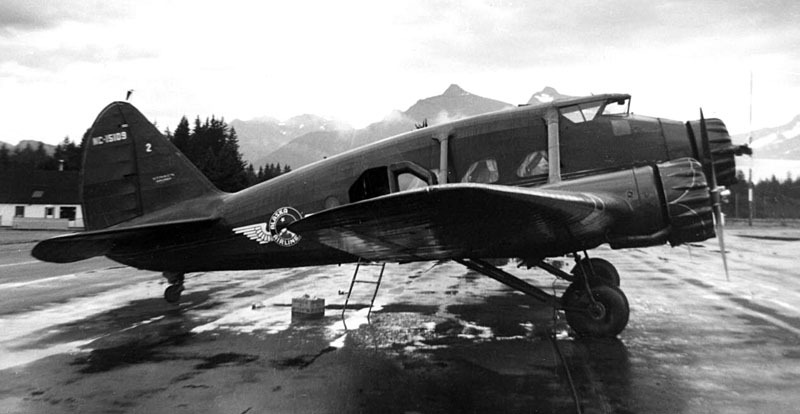 Bellanca NC259M crashed into a mountian ridge on the Kenai Peninsula on August 30, 1936, killing pilot Steve Mills and 5 passengers. "I thought the photo of this crash looked familiar. There are several other photos of this crash in his album, so I'm guessing he may have taken them. Dad was the first full time radio operator for McGee Airways, which merged with Star Air Service in 1934. The Bellanca CH-200 was a six-place single-engine light transport that first flew in 1928. Continuous improvement and more powerful engines resulted in several model numbers. 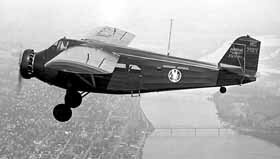 The Bellanca CH-300 was nicknamed "the Pacemaker". 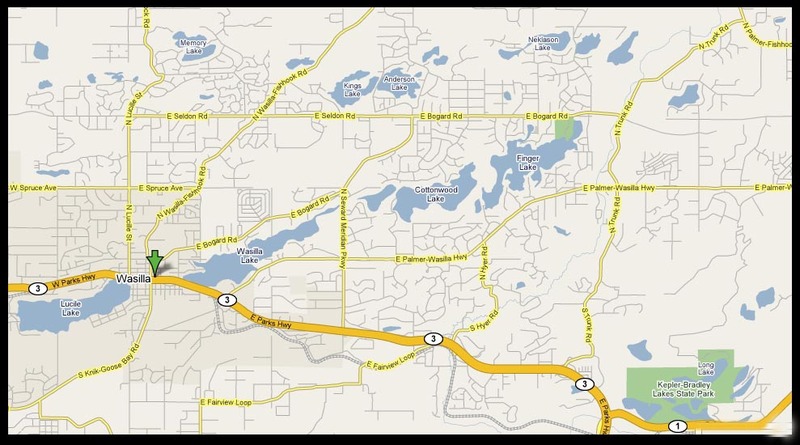 The story of Pacemaker NC251M is much longer than NC259M's because this one still exists. It was originally owned by Inter-Island Airways of Hawaii and I am not certain when NC251M was brought to Alaska. But I have no photographic documentation of it in Star livery that much predates 1940. Here it is with Inter-Island Airways, circa 1930 (web download, origin unknown). [The image was photoshopped]. "You mentioned that you had no record of he Bellanca NC251M prior to 1940. Well, I have been researching and writing a book about my grandfather, Kenny Neese. 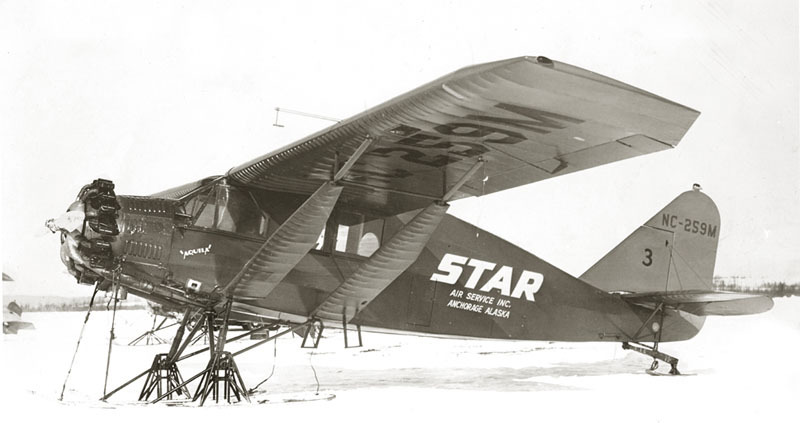 Kenny flew for McGee and Star Airways. The plane you mention is listed in his logbook! For the first time on 29Mar1936. He flew it from Anchorage to Nelchina. " 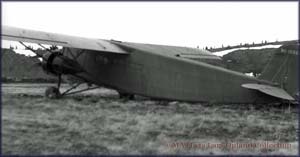 That "Skyrocket" featured on the Shanaberger website is at the Virginia museum allright, but it has been altered to resemble the Bellanca WB-2 "Columbia" and so it isn't a good representative of anything, but itself! Websites that use this sort of thing as representative bug the crap out of me. "Miss Veedol" is/was a Bellanca J-300 Long Distance Special, but these folks did a good job of getting it right and have posted some very good documentation on various pages. Here is the earliest Star livery I have for NC251CM, from MATI archives. 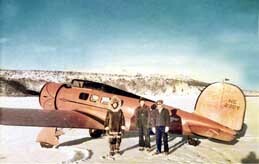 "You asked about identification of the two men standing by the Bellanca NC251M. I am going to guess that the one on the right in the high lace-up boots might be Jack Jefford. Jefford was a well known early day Alaska pilot who came to Alaska from Nebraska in 1937 to fly for Mirow Air Service out of Nome. 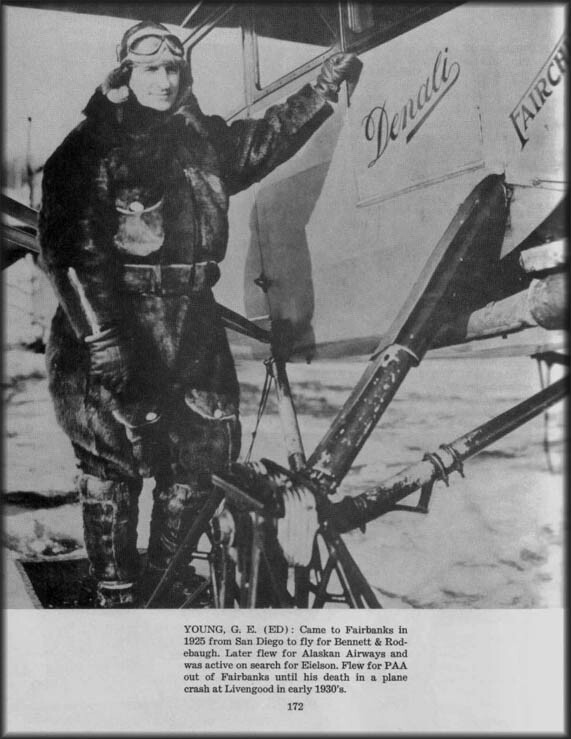 He flew for them until 1940, when he became a pilot for the CAA in Anchorage. He was a very well know CAA/FAA pilot until he retired in 1972. He died in 1979. He wrote a book titled "Winging It!" Actually, he told the stories in the book into a tape recorder, and after he died his daughter and son-in-law transcribed the tape recorded stories into a book. 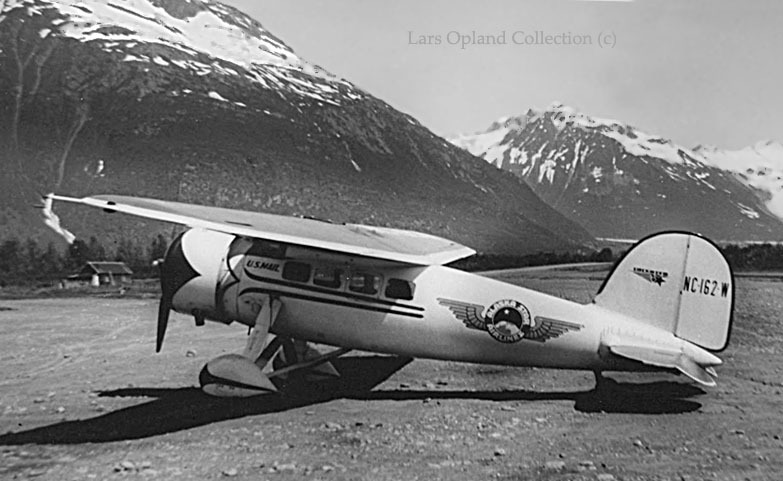 The subtitle of the book is: "His own story by Jack Jefford, pioneer Alaskan aviator". I am guessing that the person in the photo may be him because: dark hair, relatively tall (although obviously the shorter of the two in the photo.) He lists his height in his book as six feet, and his weight as 180 lbs. The parka is very similar to one that he was photographed in several times. He later had a pencil thin moustache, but that photo may be earlier. (Of course, it may not be him at all, my guess may be totally wrong!)" My wife made the trip with her parents as a small infant. 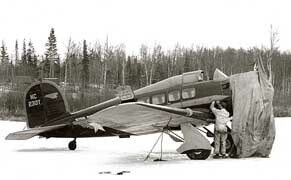 King Chris was the first DC-3 owned by the Alaskan Region of the CAA. The name plate from the King Chris was in the aviation museum in Anchorage in the late 90s, and may still be there. The full reference for the book is: Winging It! His own story by Jack Jefford, pioneer Alaskan aviator, Edited by Carmen Jefford Fisher and Mark Fisher with Clifford Cernick. Rand McNally and Co. Chicago, 1981. ISBN 0-528-81111-8. 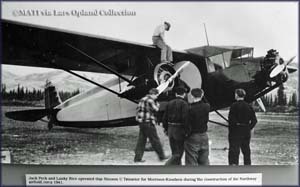 The book has many good Alaskan flying stories, several of which are about Hans Mirow, his flying service, and his airplanes. I spent over 30 years in Alaska before I retired and came south. I sure miss that place and those days!" Judging by this photo from Ted Spencer, NC251M was still in the Alaska Airlines fleet shortly after WWII. NC251M worked for Kenmore Air in Washington in the 1950's and then went into private hands. 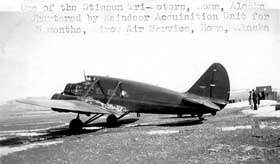 At one point it was written off and lost its original tailnumber., before this photo was taken; after rebuilt it became NC1024S because NC251M had been assigned to a Mitsubishi MU-2 back in the 1960s, while the Bellanca languished as an apparent pile of junk behind a barn. But the turbo twin has since been written off, been "cosmetically restored" and now graces a display pylon at Tulsa Airport... John Pike overcame considerable bureaucratic difficulty and restored the original registration to his Bellanca, in about 2003. Here is more information on the Bellanca Pacemaker. 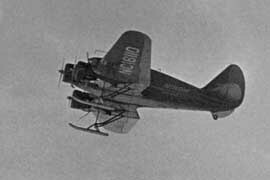 However, (on this website) the Wright J-6E or 975E was an upgrade from the original lower-compression J-6/975. On the original power plant, the exhaust exits out the front of the cylinder head, while on the E-version the exhaust port is out the side of the head and all the elbows reach in between the cylinders. 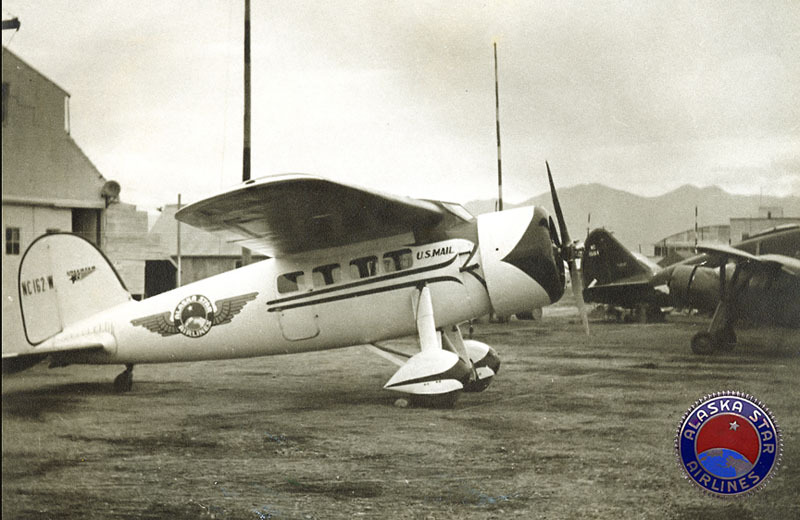 I have photos of Star Air Service's Pacemaker NC168N in 2 liveries, used between 1934 and 1940. Wrecked without loss of life in Rainy Pass in 1946, NC168N's remains have been recovered and reside at the Alaska Aviation Heritage Museum. To make things clear: the Pacemaker is the Bellanca CH-300. There was a CH-200, but it was not called a "Pacemaker" and is visibly different. CH-200 (simply called "Bellanca CH" on the tail here, I can make out NC2246 or NC2248 or NC2245...), the first Bellanca design certified as a commercial passenger carrier, with Wright J-5 engine (early CH-300 Pacemakers also had the bow-legged landing gear). "I think your NC224x Bellanca CH is probably NC224E (Echo) s/n 121. 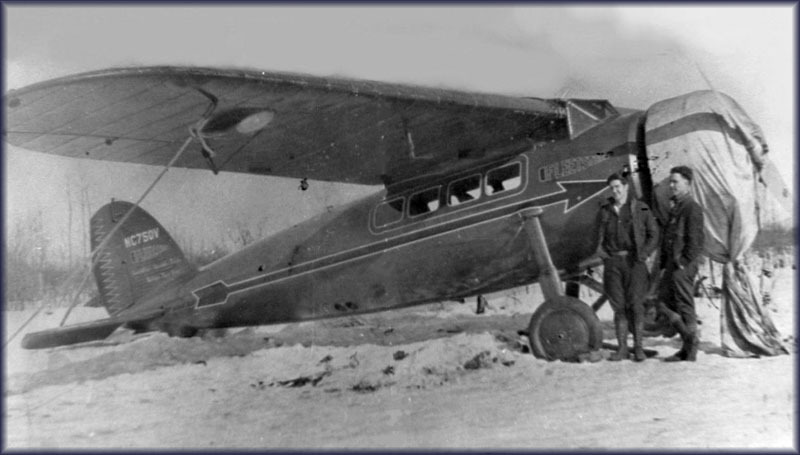 I think Bellanca CH is how Bellanca was described on registration." 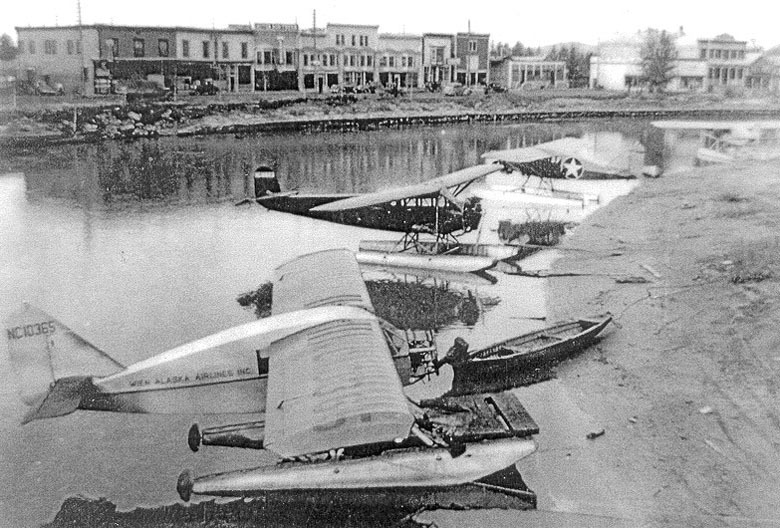 NC10365 of Wien Alaska Airlines and other floatplanes at Chena Slough, Fairbanks,AK. Pilgrim NC711Y, one of Harold Gillam's Pilgrims. 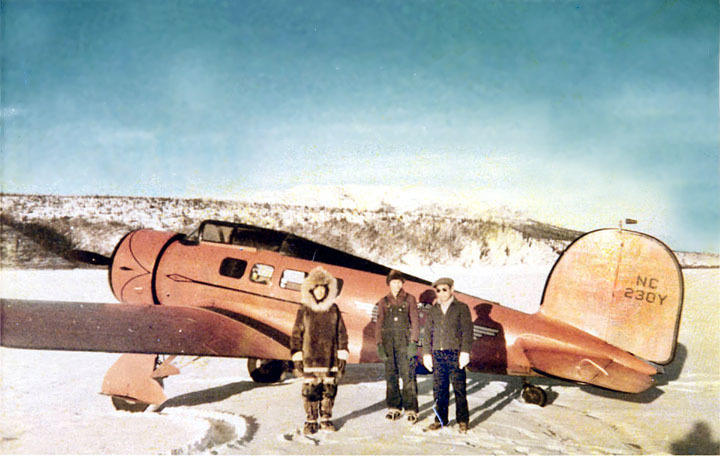 Lars wrote: "We just found this gem among my grandfather's slides a few weeks ago; Bob Reeve is seen here somewhere in the Bristol Bay region with the Fairchild FC-2W2 NC7034 which he flew under contract to Morrison-Knudson through WWII. This plane survived its service career & now awaits restoration at the Alaska Aviation Heritage Museum. " This is Fairchild FC-2W2 G-CARM. On skis. The website www.goldenyears.ukf.net/reg_G-C.htm offered the following information: G-CARM Fairchild FC-2W2, c/n 132. 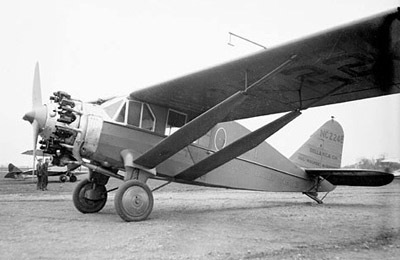 History: NC7033 G-CARM. Owner WL Phelps. (Date of first flight?) 11Oct28. Fate: Dbf after hitting buoy Juno Alaska 16Jun39. I would assume Juno is Juneau. 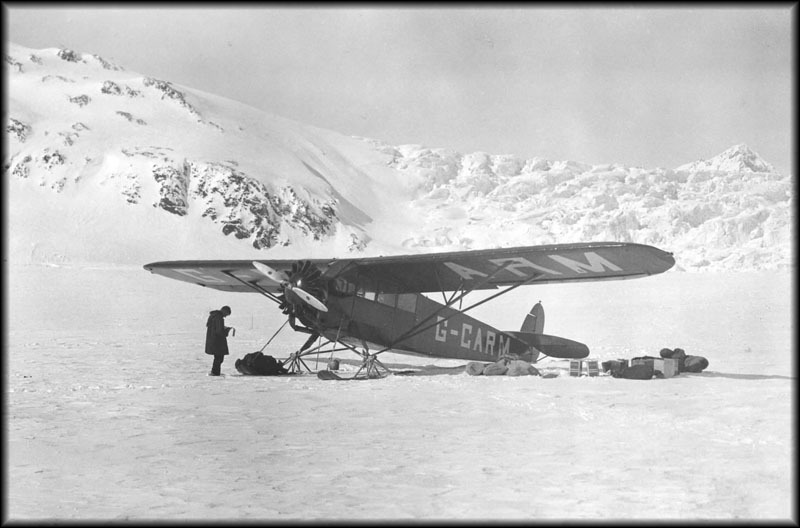 In this photo, G-CARM was being used for the National Geographic Yukon Expedition of 1935, hauling people and gear from Carcross to Lowell Glacier and back. 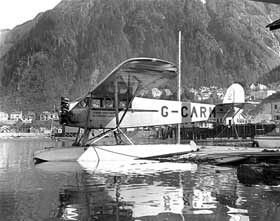 G-CARM crashed at Juneau, Alaska in 1939, killing pilot Charles Tweed." 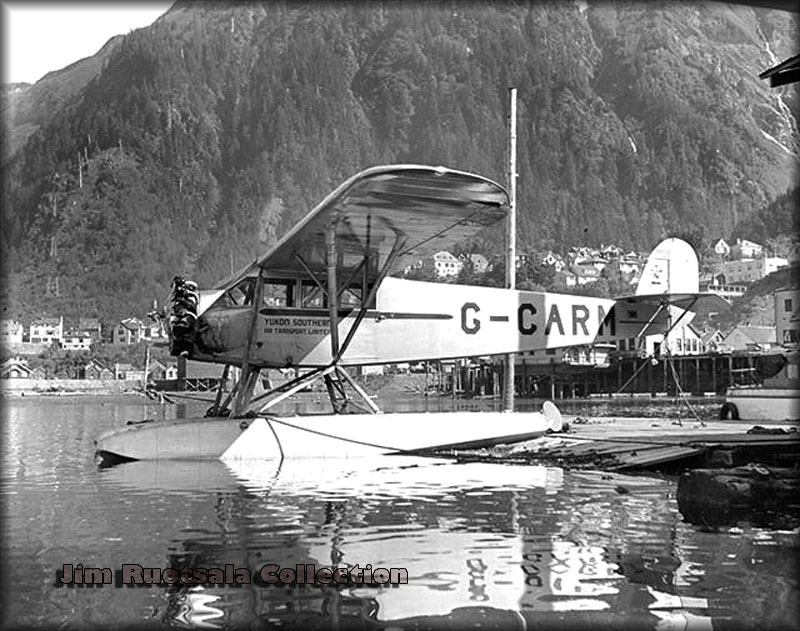 G-CARM on floats at Juneau, just prior to the 1939 crash. © Photo from the Jim Ruotsala collection, courtesy of Ted Spencer. 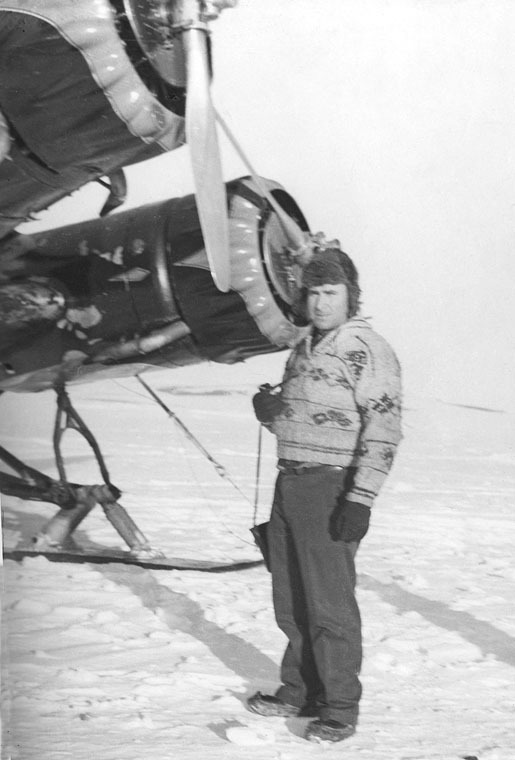 JAMES "JIM" RUOTSALA (1934 - 2007) is considered by many to be Alaska’s foremost aviation historian; he has combined his collection of photographs with others and researched aviation in the Alaska Panhandle during the early part of the twentieth century. 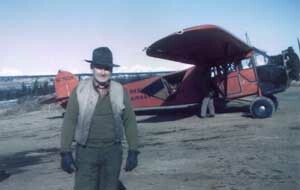 His books include 'Alaskan Wings' and 'Pilots of the Panhandle'. Ruotsala was born in Juneau on Feb. 17, 1934. 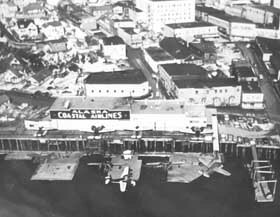 He fell in love with flying at the age of 9, when he would spend his days at a hangar now known as Hangar on the Wharf. He wrote more than 80 published articles, had a collection of about 3,000 aviation photographs and a self-published book that won him a Denali Award. During his 42 years in the military, including service with the U.S. Navy and U.S. Army Reserve, he received 21 medals and numerous letters of commendation. He remained active for many years as the commander of the 1st Civil Support Battalion, Alaska State Defense Force in Southeast. After his military career, he became divisional manager at P.F. Collier in Honolulu for 11 years. He spent some time in Anchorage as marketing director for Air Alaska before returning to Juneau in 1991. I'm sure somebody else has has pointed this out already but in case they haven't bothered ...... this registration was Canadian, not British! Under the original "International Convention for Air Navigation" signed in Paris in 1919 the "British Empire" (as they used to call it) was allocated the letter 'G' . France took 'F', Germany 'D' (for Deutschland) etc. The Brits followed this with 'E' for heavier than air machines and 'F' for lighter, followed by three identification letters. So their first aircraft was 'G-EAAA' and the others followed from that point onward. The politically independent countries of the Commonwealth (Australia, Canada, New Zealand, South Africa) identified themselves by the first two letters after 'G'; so Canada used 'G-CAxx', Australia 'G-AUxx' and so on. At that time these countries were called the self governing Dominions. This system however only lasted until the end of 1928 when Canada adopted the letters 'CF' to identify the country; in fact they have 'CG' and, I believe, 'CI' reserved as well, and perhaps more, but I'm not sure about that. The whole CF block, from CF-AAA to CF-ZZZ was almost used up by around 1972 and the 'CG' group was activated at that time, but by changing the position of the hyphen to follow the 'C'. So 'CG' became 'C-G' etc. It's a bit confusing to the historically interested because of the similarity between the original 'G-C' and the new 'C-G'. This change was applied to the CF series as well but was left open to the aircraft owner to change it, without charge (since the Department of Transport had to issue new Certificates of Registration and Airworthiness documents when the markings on the aircraft itself were changed). The ruling was, if the aircraft was re-painted, the new marks had to be applied at that time and the new documents applied for. When that took place a 'CF' aircraft became a 'C-F' one. 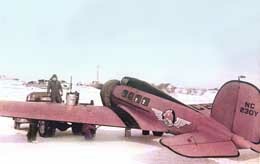 Since this screwed up the appearance of antique airplanes, the Department, in a rare demonstration of good sense, later applied a waiver for aircraft manufactured before a cut-off date - I think it was a date in 1957, but I really can't remember anymore - allowing them to keep the original "CF" markings. 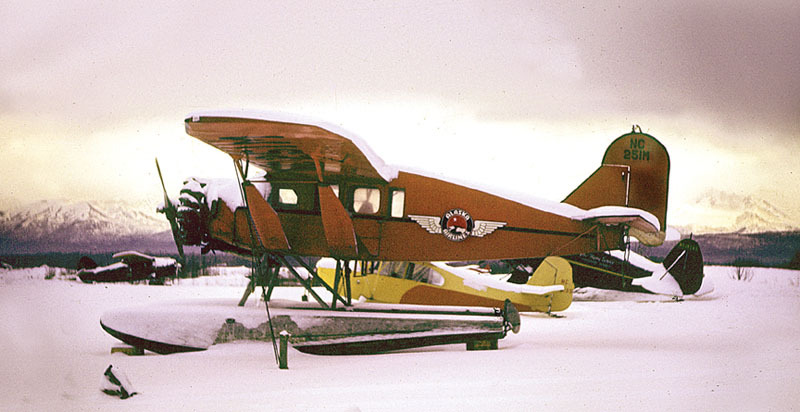 I know in the case of my own Cub, when I bought it in 1978 it was CF-EGF (registered 1946 - it was actually built in Canada being one of the "Cub Aircraft" Cubs). When I resprayed it in 1983 I had to change the marks to 'C-FEGF', which looked like hell... Then, a few years later, when the waiver was granted, I changed it back to 'CF-EGF'. 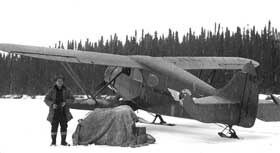 The Fairchild in your picture (G-CARM) was originally registered as NC7033 to the Treadwell Yukon Company Ltd. of San Francisco, however as it was used in their Canadian operations entirely (they had a big silver mine north of Mayo in the Yukon Territory) it had to be registered in Canada. Willard Phelps was their Canadian lawyer in Whitehorse and hence it was put in his name. 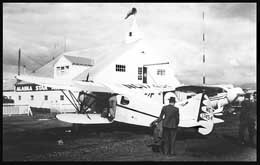 It was later sold by them in 1935 to George Simmons' outfit in Carcross, Yukon (Northern Airways Ltd.), then re-sold a year later to Grant McConachie's "United Air Transport Ltd." of Edmonton, Alberta for his northern operations. 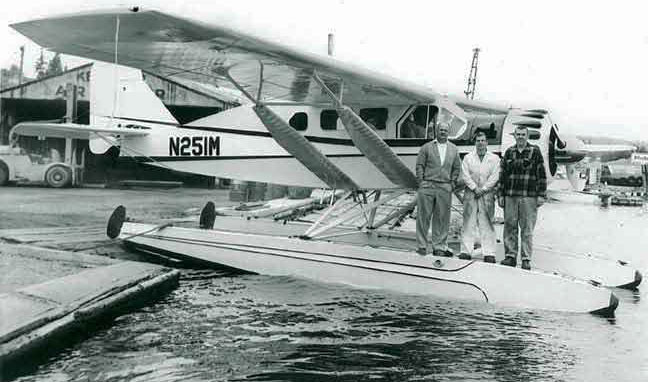 This company was forced to change their name the next year after being threatened with a lawsuit by United Air Lines and became "Yukon Southern Air Transport Ltd."
As you point out, it was written off in a tragic accident in Juneau on June 15, 1939 when Charlie Tweed (photo with Grant McConachie and Sheldon Luck) hit a channel buoy in the Gastineau Channel while taking off. 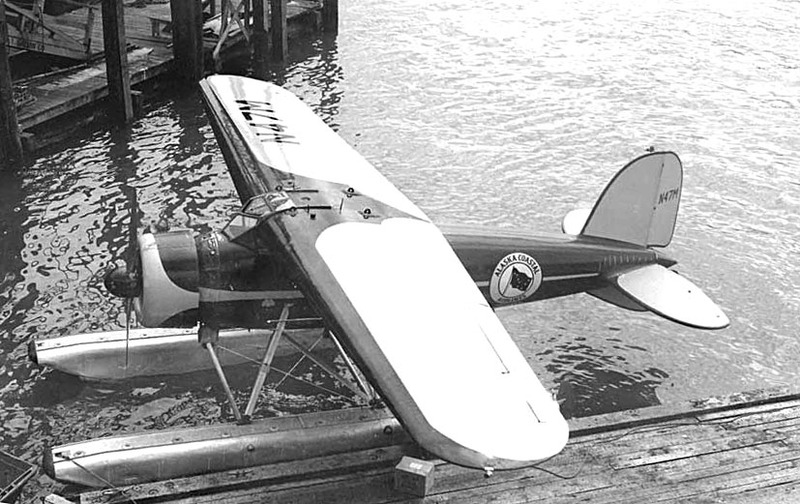 Tweed was a very experienced pilot and well thought of but the Fairchild was even blinder than most seaplanes before it got on the step and he obviously just didn't see it. Yukon Southern late evolved into "Canadian Pacific Airlines" which was operating as "CP Air" when they were later swallowed up in further mergers. 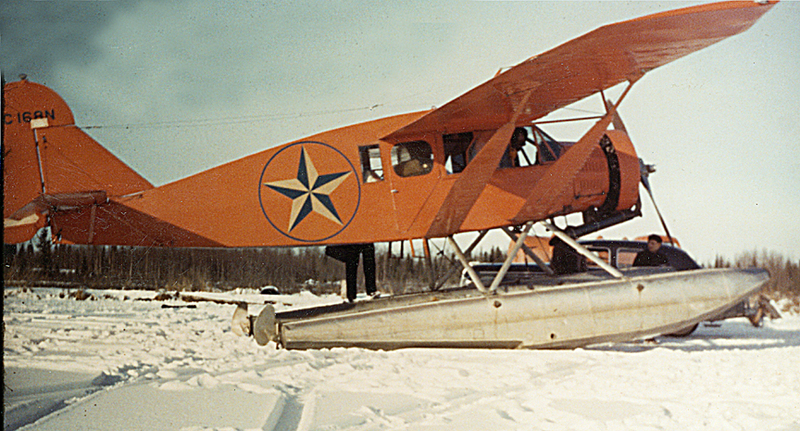 Stinson SB-1 Detroiter of Wien Alaska Airways ('of Nome'). "The Detroiter was the former Wilkins Expedition "Detroit New 2". 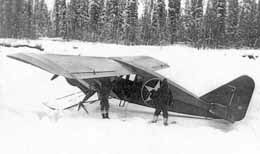 This aircraft is shown in a photograph from Robert W. Steven fabulous publication 'Alaskan Aviation History' (Polynyas Press, 1990)." This is a Pilgrim left out in the snow, but with protection against the cold (engine) as well as snow and ice (wing surface); it has tail number NC709Y. This photo of Gordon McKenzie, in one of the Star Pacemakers, was taken at Merrill Field in the late 1930's or perhaps 1940.
on their way to Alaska, were drafted into the search for 'Paddy' Burke while in Yukon Territory. 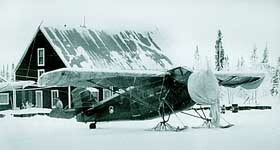 One F.71 was lost in a take-off accident and the Fleetster broke through lake ice during search operations. The Fleetster then had to be salvaged plus numerous jury repairs made to fly it on to Fairbanks. 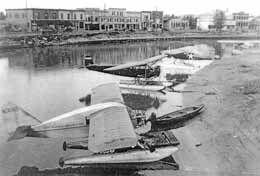 With no instruments, and a second man operating the rudder controls from a position behind the pilot, they still stopped on the way and picked up passengers!!!" (Photos from the archives of the Museum of Alaska Transportation and Industry (MATI), via the Lars Opland collection). 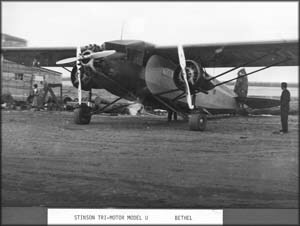 Peck & Rice also operated this Stinson T (No, it's not a 'U'; MATI added many incorrect captions) under contract to Morrison-Knudson, during WWII (MATI archives). Evidently there was more than one Stinson T involved, as the registraion of the plane above ends with '...77'. 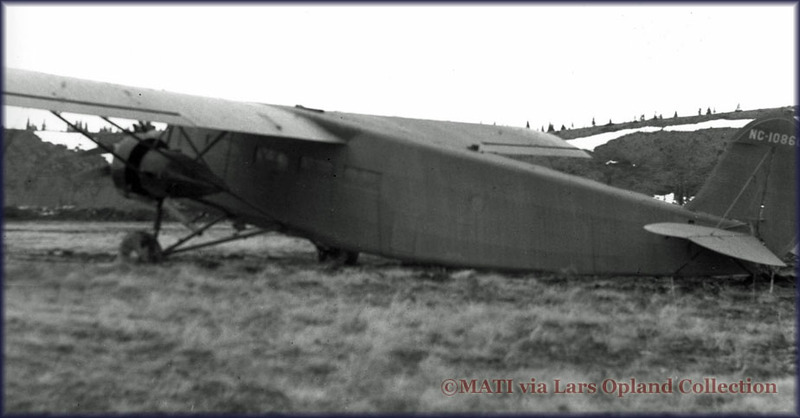 Lars Opland sent me this (undated) photo of Waco UIC N13409, seeing I had seen it partly disassembled at the Lake Hood Museum last summer. 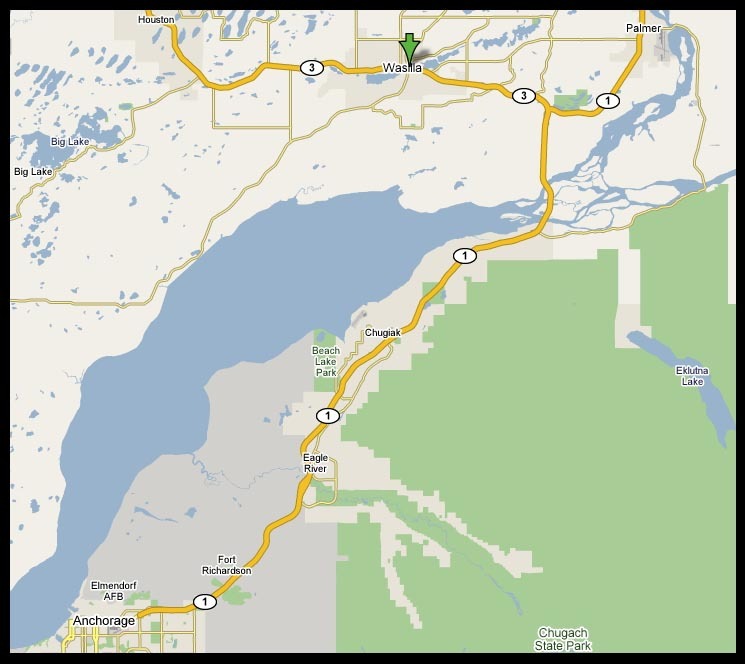 Check Wasilla on Airnav.com and you get 58 airports/seaplane bases and privat airstrips !